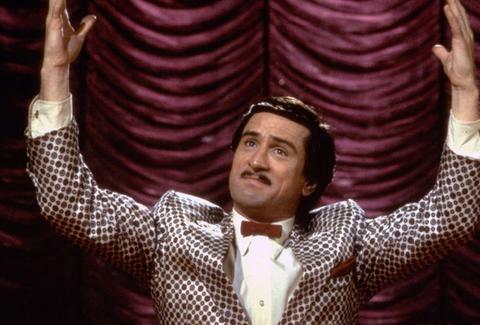 It's no secret that Robert De Niro's recent body of work hasn't quite earned the 72-year-old actor the same prestige he garnered at the height of his career. Films like Raging Bull, for which he famously gained 60 pounds, and The Godfather: Part II have been replaced by Meet the Fockers and this year's miserably received Dirty Grandpa. Now, James Chapman claims to have used data from Rotten Tomatoes to calculate the exact moment De Niro stopped giving a damn about the quality of his roles. Chapman's analysis says the year everything changed was 2002, the same year that De Niro starred in Analyze That, the charmless sequel to Analyze This. 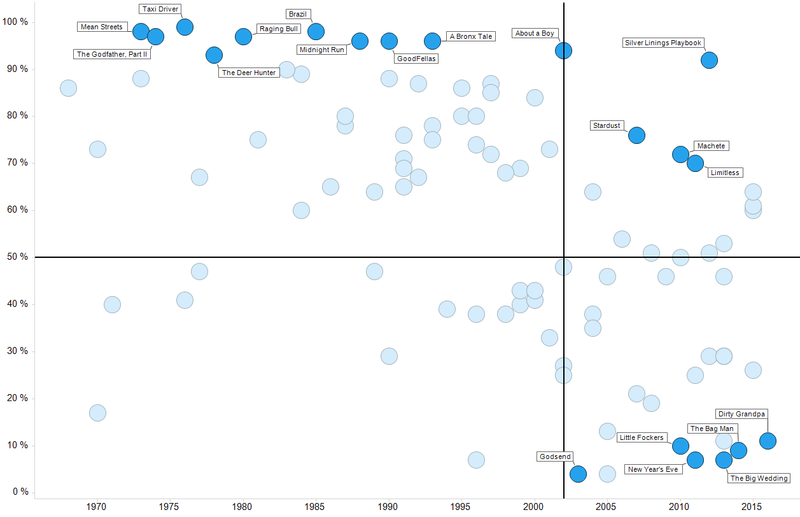 The data averages Rotten Tomatoes scores for each of the movies De Niro made in any given year. Averaging the films means that some well-received late works like The Good Shepherd, Silver Linings Playbook, and Machete are getting buried beneath the tidal wave of cash-for-clunkers bombs like Godsend and Grudge Match. Nonetheless, there is an undeniable ski slope happening here. But how can any actor keep up the kind of track record De Niro had going? It's nearly impossible. For over 25 years he had a non-stop string of great roles in films like Mean Streets, Goodfellas, Casino, King of Comedy, Taxi Driver, and The Deer Hunter. One explanation for the roles he taken recently — outside of accusations that alimony or real estate ventures are to blame — is that Hollywood doesn't have many prestige roles for 72-year-old actors. And yes, Helen Mirren, Samuel L. Jackson (more or less), Meryl Streep, Max von Sydow, and Ian McKellan, among others, are examples of aging actors who have largely chosen quality over quantity, but the number of roles available for older actors remains limited. Whether or not you believe he cared less after 2002, during his career he's been in over 30 films that have a Rotten Tomatoes rating above 70 percent and 12 that are over 90 percent. No matter what order they're taken in, that's far more than most living actors can claim.